The Lincoln Paper and Tissue LLC mill as seen Thursday, Dec. 12, 2013. The auctioneer of two Maine mills said it plans to put the facilities and equipment up for auction later this month, after negotiations with an interested buyer in India fell through for the Lincoln mill. Rabin Worldwide, one of the partners in a joint venture that bought the Lincoln and Old Town mills, said it plans to put both facilities up for sale during a four-day auction in Bangor later this month. The results of the auction will determine whether any of the equipment from the mills have a future making paper in Maine. The owner group led by Boston-based Gordon Brothers Group said in a statement that it was in “close talks with a prospective buyer in India” but that the talks ultimately fell through. 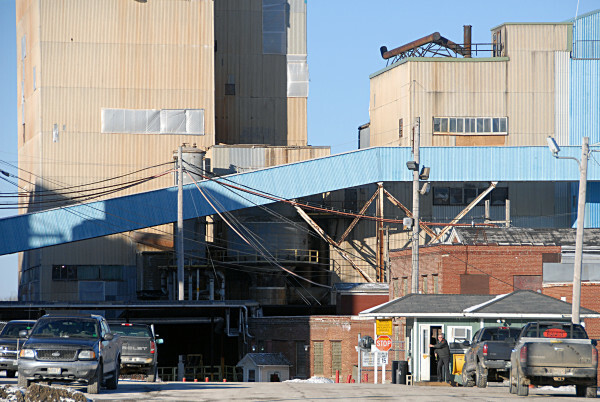 To keep any of the assets making paper in Maine, the company suggested a buyer could move the tissue-making machines from Lincoln to the Old Town pulp mill, restoring tissue capacity that was removed by Georgia Pacific after the shutdown 2006. For that reason, the auctioneer is holding the sales together from April 19 to April 21 with a live and online auction. A fourth day of online-only auctioning is set for April 22. The auction of the property at the Lincoln mill includes three paper machines, pulp processing equipment, boilers and facilities. The owners already found a buyer for one of the company’s tissue machines, which union officials and former employees said was a death knell for papermaking in Lincoln. A bankruptcy court cleared the way two weeks ago for the auction of Lincoln’s machinery to move ahead, approving the sale of certain intellectual property that included product recipes and software to run certain equipment. In Old Town, the company said it’s in talks with investors interested in the biomass boiler plant, a wastewater treatment facility and warehousing facilities but plans to auction all the pulp processing systems. The company will hold the auctions at the Hilton Garden Inn on Haskell Road in Bangor, with inspection times for the properties scheduled next week. The consortium that owns both mills is led by Gordon Brothers Group and includes Capital Recovery Group, PPL Group and Rabin Worldwide.